Andrew Jackson Hinshaw1,3,8,9,10 [Andy J. Henshaw5,6, Bud Henshaw7,11, A. J. Hinchee12, William Henchey12]. A.J. Hinshaw, age 36, male, born in Tennessee. R.A. Hinshaw, age 34, female, born in Tennessee. J.J. Hinshaw, male, age 12, born in Tennessee. L,A. Hinshaw, female, age 8, born in Tennessee. E. Hinshaw, female, age 5, born in Kansas. B.R. Hinshaw, male, age 3 months, born in Kansas. H. Hinshaw, female, age 4, born in Tennessee. Hinsh, Andrew J, head-of-household, age 38, born Sept 1861 in Tennessee; father born in North Carolina; mother born in Tennessee; married 14 years; rented home; cannot read or write. Hinsh, Ruth A., wife, age 39, born Dec 1860 in Tennessee; parents born in Tennessee; married 14 years; 7 children, 6 living; cannot read or write. 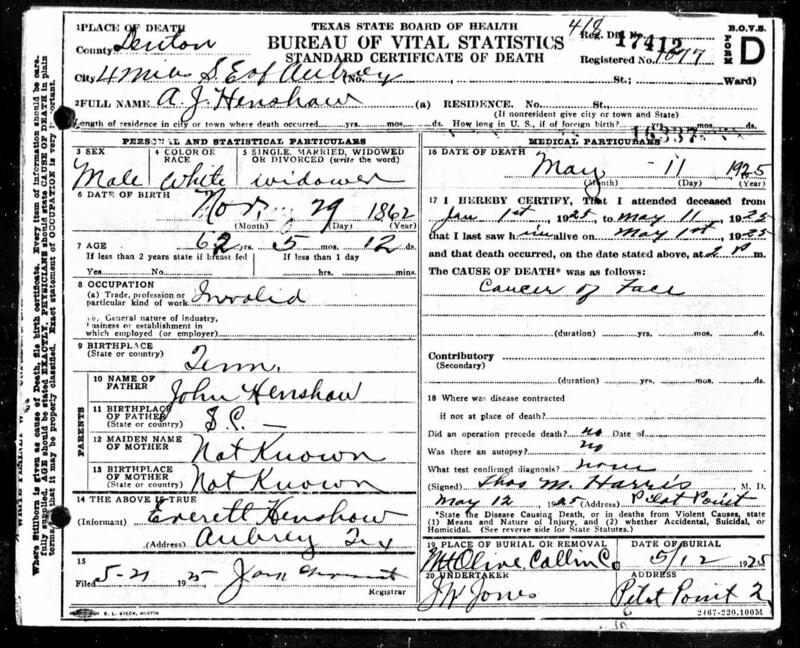 Hinsh, John J., son, age 16, born Dec [unclear] 1883 in Tennessee; parents born in Tennessee. Hinsh, Lou M, daughter, age 13, born Oct 1886 in Tennessee; parents born in Tennessee; cannot read or write. Hinsh, Martha E, daughter, age 12, born Jan 1888 in Tennessee; parents born in Tennessee; cannot read or write. Hinsh, Hannah N., daughter, age 10, born Sept 1889 in Tennessee; parents born in Tennessee; cannot read or write. Hinsh, Beny R., son, age 5, born Dec 1894 in Tennessee; parents born in Tennessee. Hinsh, Joel B [unclear], son, age 1, born July 1898 in Tennessee; parents born in Tennessee. Hinsh, Nora Bell, daughter, age 3 months, born Mch 1900 in Tennessee; parents born in Tennessee. Henshaw, A J, head-of-household, age 48, born in Tennessee; parents born in Tennessee; second marriage, married 25 years; occupation: farmer, general farm; rented farm. Henshaw, Adaline, wife, age 50, born in Tennessee; parents born in Tennessee; first marriage, married 25 years; 8 children, 7 living; cannot read or write. Henshaw, Lizzie, daughter, age 22, born in Kansas; parents born in Tennessee. Henshaw, Annie, daughter, age 19, born in Tennessee; parents born in Tennessee; cannot write. Henshaw, Benjamin, son, age 15, born in Kansas; parents born in Tennessee; attended school. Henshaw, Daniel, son, age 12, born in Tennessee; parents born in Tennessee; cannot read or write; attended school. Henshaw, Nora, daughter, age 10, born in Tennessee; parents born in Tennessee; cannot read or write; attended school. Henshaw, Everitt, son, age 7 [unclear], born in Tennessee; parents born in Tennessee; cannot read or write; attended school. Henshaw, Andy J., head-of-household, age 59, born in Tennessee; father born in North Carolina; mother born in Tennessee. 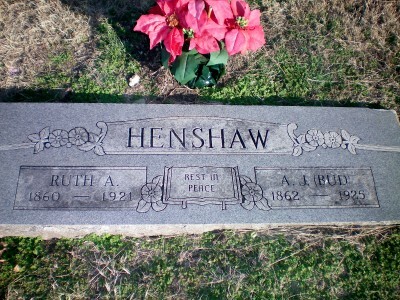 Henshaw, Ruth A., wife, age 59, born in Tennessee; parents born in Tennessee. Henshaw, Dan, son, age 21, born in Tennessee; parents born in Tennessee. Henshaw, Nora B., daughter, age 19, born in Tennessee; parents born in Tennessee. Henshaw, Everett, son, age 16, born in Tennessee; parents born in Tennessee. Oakley, Martha E., daughter, age 32, born in Kansas; parents born in Tennessee; married. Oakley, Ethel L., grand daughter, age 5, born in Texas; father born in Kansas; mother born in United States [sic]. Oakley, Jess W., grand son, age 4 years 6 months, born in Texas; father born in Kansas; mother born in United States [sic]. Oakley, Everett, grand son, age 3, born in Texas; father born in Kansas; mother born in United States [sic]. Note that Ruth's death certificate shows she died in 1922 and was buried in Krum, Texas; but her name, and a 1921 death year, are engraved on the same stone with Andrew in Williams Cemetery in McKinney, Texas (see gravestone below). So it appears that she was added to that gravestone at a later date (probably at the time of Andrew's death). It is unknown if her body was actually moved or if the gravestone engraving is simply memorial. John James Hinshaw marriage record. 1895 Kansas state census, White Mound, Jewell County, Kansas; roll v115-67, dwelling #36, family #39. 1900 census, Civil District 6, Greene County, Tennessee; roll T623-1573, ED 34, page 11A, line #42, dwelling #208, family #208. Lou Ann Henshaw death certificate. 1910 census, Precinct 1, Collin County, Texas; roll T624-1539, ED 2, page 10A, line #15, dwelling #131, family #133. 1920 census, Precinct 8, Denton County, Texas; roll T625-1796, ED 68, page 14A, line #13, dwelling #180, family #183. 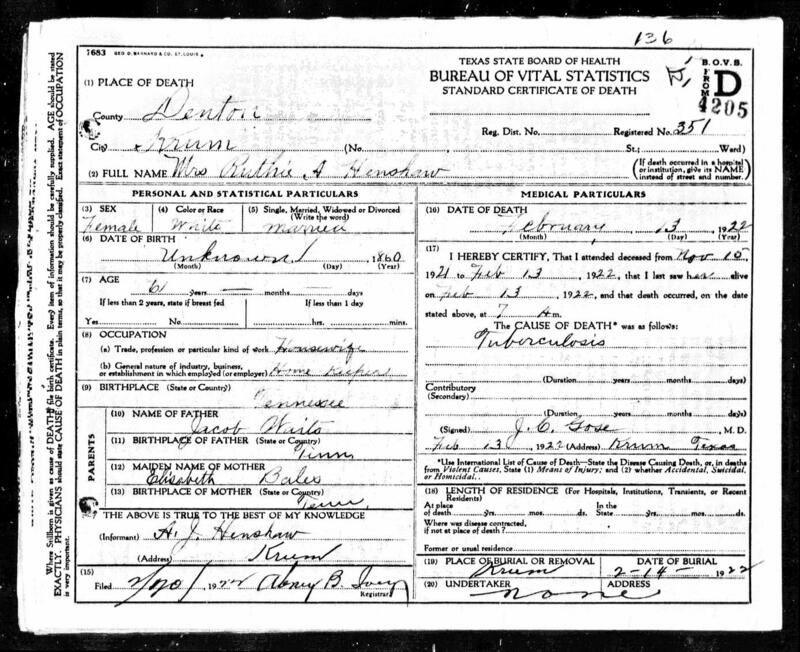 Nora Bell Henshaw death certificate. 1870 census, 7th Civil District, Romeo P.O., Greene County, Tennessee; page 239B, line #17, dwelling #39, family #39. 1880 census, 7th Civil District, Greene County, Tennessee; roll T9-1258, ED 49, page 116D, line #13, dwelling #228, family #230. Contribution from Glenda Mounger (). Tennessee, Enumeration of Male Voters, 1891; http://www.ancestry.com.